Extra wide panoramic photo printing. Todays cameras are able to take extra wide photo panoramas. There are also softwares available that allow the creation of extra wide stitched panoramic photos. Therefore we offer this special range of photo print sizes suited to extra wide panoramas. If these sizes are a little extreme for your image, why not look at our standard panorama photo printing. High quality poster prints in high resolution with vibrant colours for your unique photo panoramas. Todays cameras can sometimes take extra wide photo panoramas. There are also softwares available that allow the creation of extra wide panoramic stitched photos. 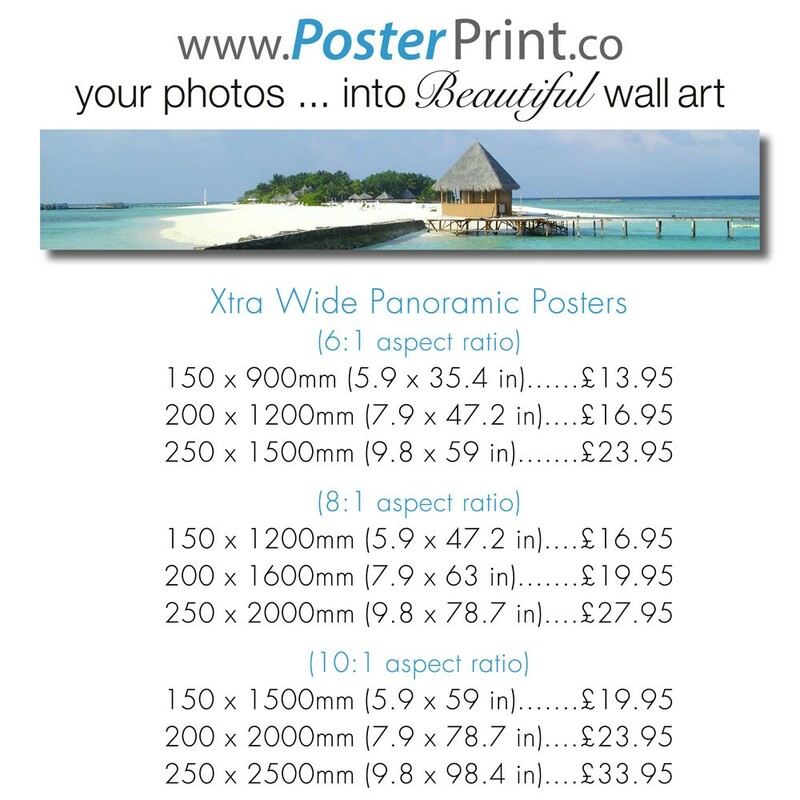 Therefore we offer this special range of print sizes suited to extra wide panoramas. If these sizes are a little extreme for your image, why not look at our standard panorama photo printing. Please feel free to contact us should you require a special panorama size. Extra wide panoramic prints - Amazing! Extra wide panoramic prints - Just to let you know the print arrived safe today, and it looks amazing! Thank you and have a great new year. Pleased to find someone able to print my odd sized photo and then even more pleased with the result. Cutting wasn't exact as there is a little white edge at the top, but if I can make a frame for it, the white edge won't show anymore. Received the print on Saturday and it looks fantastic, just what I wanted. The speed of your delivery from order is excellent. I wish you continued success with your business.